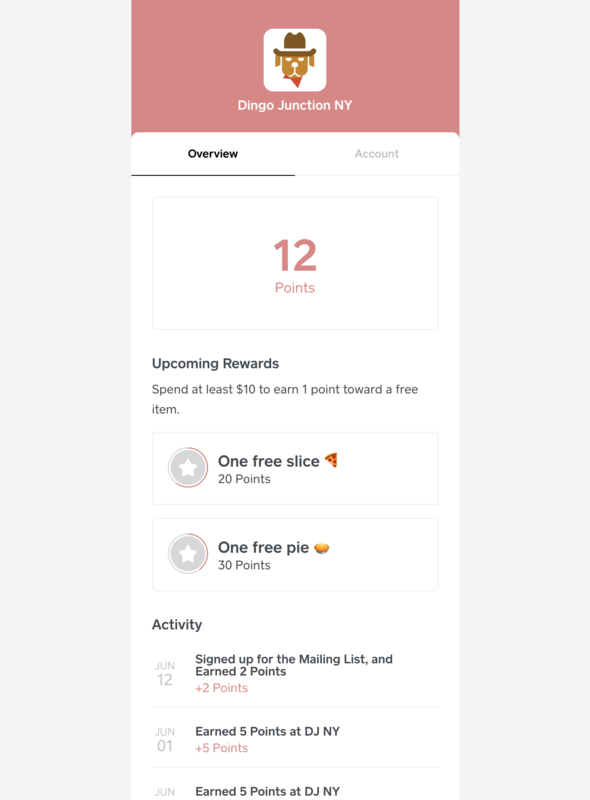 If you’re using the Square App and are designated as a business, you can subscribe to Square Loyalty and create a digital rewards program to reward repeat customers. Loyalty points can be applied to cash and card purchases. Your customers can sign up quickly and easily by entering their mobile number right in the register – and earn punches no matter how they pay. In order to create and manage a loyalty program, including viewing the Loyalty section of your Square Dashboard, employees will need the Manage Services permission enabled for their profile. Learn more about managing employees. To earn points, customers must provide the same phone number for each payment method used at your business. A new profile will be created in your customer Directory if the customer uses a different phone number. Note: If you’re using Android or Square Register, you’ll need to disable Skip Receipt Screen and Automatically Print Receipts in order to see the Loyalty screen at checkout. Per Visit: Reward points based on a per-visit minimum. For example, if your customer spends more than $5, they will earn 1 point per visit. Per Amount Spent: Reward points based on the total amount spent before tax and tip. For example, 1 point per every $5 spent on a purchase. Per Item or Category: Reward points based on purchasing a specific item or category. For example, a drip coffee earns 1 point, a latte earns 2 points, and a sandwich earns 3 points. Discount on the Entire Sale: Set a fixed percentage or dollar discount for entire sale. Discount on an Item or Category: Set a fixed percentage or dollar discount on specific items. For example, 20% off all coffee. Free Item: Select a specific free item. For example, a free latte. You are able to customize the terminology of your loyalty program to fit your businesses’ brand. Instead of your customer’s earning points, you can choose to call them anything you want (for example stars, mugs, or bubbles). Log in to the Loyalty section of your online Square Dashboard > Select Settings. Under Terminology click Edit and enter your prefered term > Save. Log in to the Loyalty section of your online Square Dashboard > Select Settings. > Create A New Reward. Select your reward type from the dropdown and choose the reward value > Enter the discount that will be applied for the reward. Please note: You can only create 100 rewards levels for your Loyalty Program. If you’re editing an existing program, customers will not lose previously-earned points or rewards and will start to accrue points based on the new rules. It’s your responsibility to inform customers of changes made to an existing Loyalty program. Try sending a marketing campaign to your Loyalty customers to promote your new rewards program! You can set an expiration date for your issued points in order to help incentivize your customers to come back sooner. 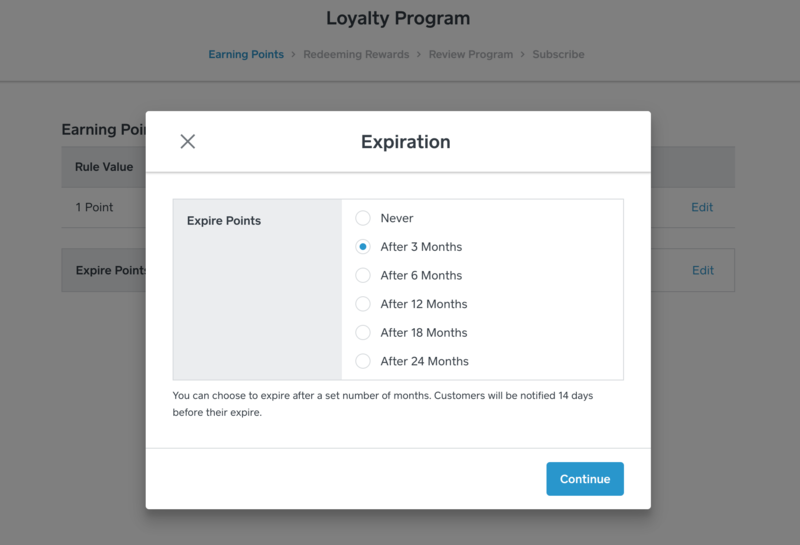 You are able to add points expiration at the time you create your Loyalty program and from the Settings tab of your online Square Dashboard. Navigate to the Loyalty section of your online Square Dashboard and select Create a New Rule. Under Expiration click Edit and set when you’d like your points to expire, or select Never if you’d rather not set an expiration date. Note: You can choose to expire points after a set number of months. Customers will receive an SMS notification 14 and 7 days before their points expire. Go to your Customer Directory and select a customer. Under Loyalty in the customer’s profile, click the three horizontal dots. Click View Expiring Points to view total points that will expire for that customer. Go to your Customers Tab and select a customer. When creating your loyalty program, select Partial Discount on an Item. Select the item(s) that qualify for the reward. Set a reward value equal to the item price before any modifiers are applied. The reward will be deducted from the purchase total so that the item is free but the modifiers are not. If you already have an active Square Loyalty program, existing customers will receive an SMS notification with the offer. New customers will be notified of the offer upon enrolling in your loyalty program. While Square Loyalty tracks your customers’ points and rewards by their phone number, you can still collect their email address for use with Square Marketing. When you enable the Collect Contacts feature in Square Loyalty, new customers will receive an SMS message offering an additional amount of points in exchange for their email address. Customers who provide their email address are automatically added to the Reachable and Loyalty Participant groups in your Customer Directory. Visit the Settings tab of your Loyalty dashboard. Toggle on Offer customers points in return for their email addresses. Enter amount of points being offered for email address. Head to the Loyalty tab in your online Square Dashboard. In the Settings tab > enable Offer customers points in return for their email addresses. Click Next to continue with setup > Save. Select which locations you would like to have participate during program setup. Your customers will be able to earn points and redeem rewards at any of your participating locations. To create additional locations, visit Locations in your online Square Dashboard and click Create Location. Once you add a new location, you cannot delete locations, but you can deactivate a location at any time. Inactive accounts will still be visible and can be reactivated at any time. Note: If you’d like to offer a free item as a loyalty reward, you must select an item or category from each location’s Item Library in the reward field. This must be done to ensure coupons are redeemable across all business locations. Your customers won’t be able to redeem coupons at any locations that don’t have an item selected.